This post is part of our Virtual Engagement Party. These frames were sent to ABOAB for review. I have boxes and boxes of photos I took when I was a kid. 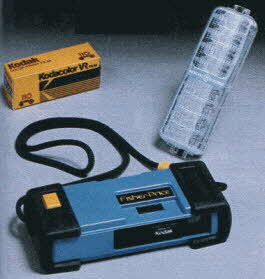 I had an old school Fisher-Price/Kodak camera when it was modern and not old school. I won bingo on a family camping trip and used that to buy an up-to-date (at the time) camera when I was in middle school (although my friend Allison, who was actually one of my bridesmaids, tried to convince me to use the money to buy a gecko). And then, for one of my birthdays many years later, my mom bought me a digital camera. And since then, the majority of my photos have lived in social media only. It's a sad turn we've taken, kind of like how we all just text instead of call each other. I made it a point to make three phone calls in the morning before I sat down to write this post. I also made it a point to print and display our wedding photos because they deserve a home outside of Facebook and Instagram. 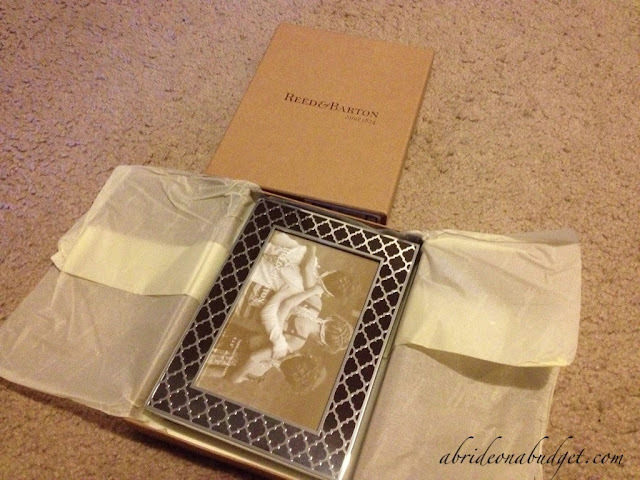 We were sent two gorgeous frames from Reed & Barton for our wedding photos. The one above is the Carson 4x6 frame. I anticipated that it would hold my 4x6 photos nicely and had one specifically picked out for the frame, which boasts that it can be displayed horizontally and vertically. 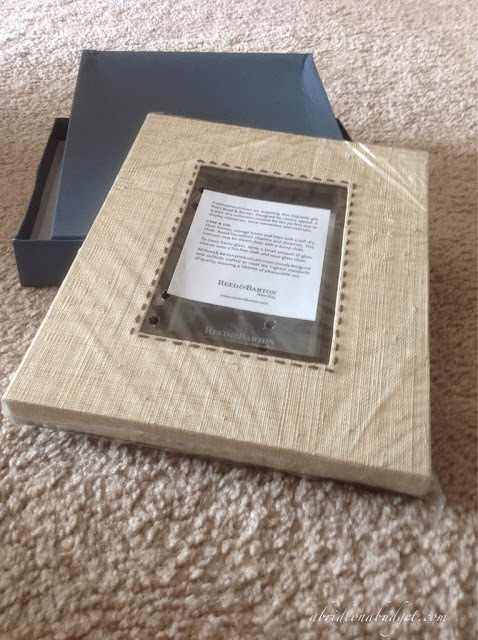 When it arrived, though, I realized that the border of the frame was actually almost 2.5 inches wide -- making it too large to fit vertically in the bookcase in our living room. Of course, the photo I wanted was vertical, so I had to pick a new photo. No worries. Our photographers edited and sent us almost 1,500 wedding photos. I had another to choose. The frame fits perfectly on the shelf I picked. And the photo I picked is a bit more animated than any of the other groomsmen photos. I actually have this huge canvas print of me and my bridesmaids making funny faces at our engagement party. It's on our "funny face wall" (a wall filled with animated photos of our family and friends that just makes my heart so happy when I walk past it). This photo of Pete, his groomsmen, and our ring bearer being animated is the perfect compliment to my bridesmaids photo. If you look through our wedding photos, you'll crack up. There are so many photos that are just filled with -- oh, what's the word. I want to say happiness, but all weddings are happy. Our photos, they're very candid and just capture everyone having fun. I mean, our wedding photos are probably the only ones that feature the groom posing in a port-a-potty. We do have a bunch of very romantic photos to choose from too. And that's what I picked for the Kasbah 4x6 frame from Reed & Barton. The Kasbah frame comes in a trio of colors: chai, mocha, and espresso. I originally wanted the chai (which makes me laugh because I can't stand chai tea) because it was the lightest of the colors. I wanted one where the colors on the photo would pop and the frame would disappear. Unfortunately, though, the chai frame was out of stock. So I decided, instead, to pick the espresso. It arrived and was absolutely stunning. I was so happy that the chai was out of stock when the espresso arrived. This photo of the frame and photo doesn't even do it justice. It has a nice weight to it, which Pete noticed right away. And it is just beautiful. The light catches the silver and it shimmers. The silver catches your eye and the dark espresso color seems to fade, enhancing the photo. I'm kinda bummed because in the photo above, the colors of the photo look dulled and muted, but in the actual photo itself, they're super vibrant -- and extra so because of the frame. The way these are set up, one is to my left and one is to my right. I can see them both from my desk, which is a nice way to smile through the workday. That's something that photos existing online-only just can't do. BRIDAL BABBLE: Which frame is your favorite? Those are both very pretty, but the Kasbah is my favorite. I can see the weight to it from here, and I love the design. I really like Prescott! The Kasbah is very pretty too. These are stunning...and would be pretty for the vinyl decals i have for our wedding! 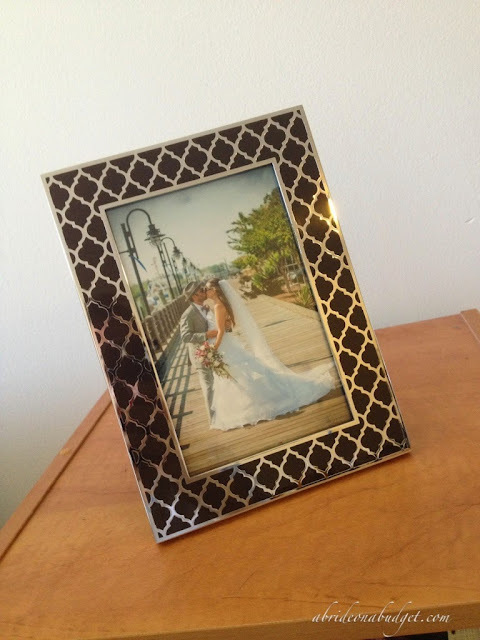 I love these picture frames would be great to display wedding pics! These frames are very different, but both look very well made with great materials. The Carson would work great at an outdoor/rustic reception and the Kasbah would make a gorgeous focal point in any home! These frames are just beautiful! The frames are beautiful. That burlap looking one would be amazing for my daughter as that is one of the features in her upcoming wedding. 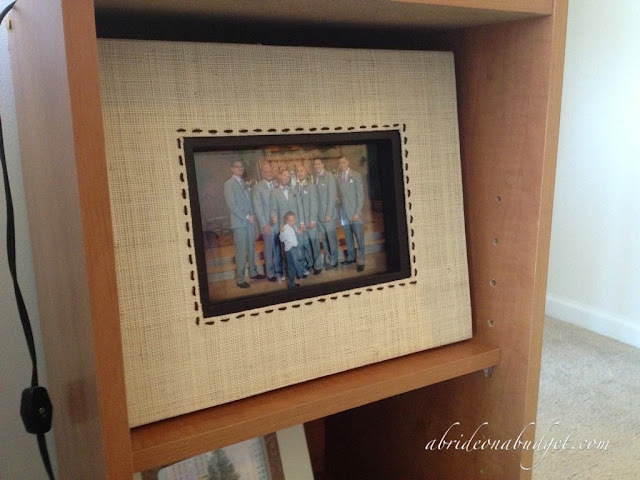 I love the neutral tones and how beautiful the frames are! I love the earth tones and its so neutral you can use it anywhere. These are unique and they look like great quality! These frames are very nice!